Market State 1 Bullish/Rational (42 trading days): We remain in a low risk, slow-moving bull market. Sounds like a broken record, doesn’t it? 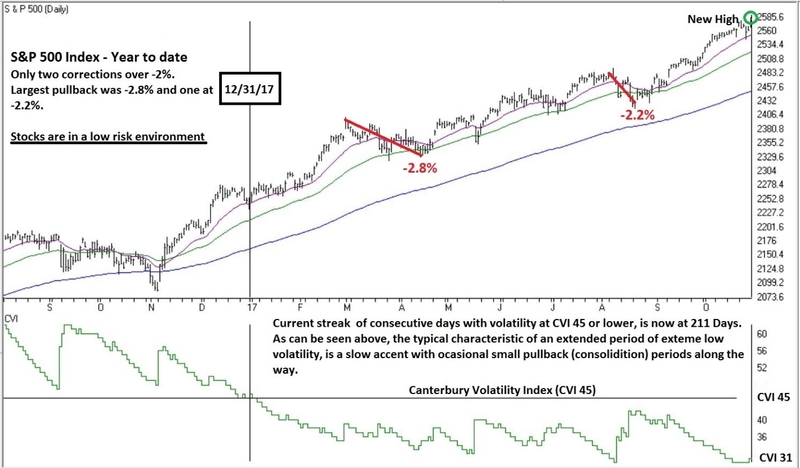 Canterbury Volatility Index (CVI 31): No change in the S&P 500’s volatility (CVI) from the previous week. The volatility, as measured by the CVI, has been at historically low levels for all of 2017. The downside from here could be a normal bull market pullback of about -3% to -5% from the October 20th S&P 500 peak at 2575, or a single day “outlier (up or down about 1.5% or more) could occur. A single day outlier is typically followed by normal trading as if nothing had happened. Last week, Small Cap stocks continued to consolidate their September gains. The Russell 2000 has been sideways over the last 18 trading days. The NASDAQ 100 shot up Friday and closed the week up +1.1% while registering a new all time-high. The S&P 500 was only up 0.2% for the week also closing at a new high. The NASDAQ is outperforming the S&P 500, which is a bullish indicator. The all stock advance/decline line (number of stocks going up less the number going down) is near a new high. This indicator is showing that the breadth of the market is broad based, meaning the rising tide is lifting most ships-- another confirmation of a bull market. Chart 1 illustrates why low volatility is a low risk characteristic with high potential for positive returns. U. S. Treasury Bonds (20+ Year; symbol TLT) and Treasury Notes (7-10 Year; symbol IEF) remain in a bearish Security State. Canterbury does not subscribe to the popular notion that bonds are always safer than stocks. Any security that is showing positive supply and demand characteristics (a bullish Security State) is conservative. On the other hand, any security that is showing negative supply and demand the characteristics (a bearish Security State) is risky. Chart 2 – compares the low risk and high return of the S&P 500 versus the higher risk and negative returns of bonds. Stocks are in a bullish environment while bonds are in a bearish environment. Financial markets are not about the “risk return” relationship. A portfolio with higher risk will have larger declines and higher volatility, both of which are bear market characteristics. Adaptive Portfolio management is about constructing and maintaining the most “efficient” portfolio based on the changing market environments. All traded securities will have both bullish and bearish periods. An adaptive portfolio strategy will have a rules-based process designed to adjust and hold securities with low risk, bullish characteristics.